52/159 David Mumpower Rocks harder than any movie has rocked since the days of Bill and Ted. Rock on! 52/52 Les Winan Even as someone who enjoyed their first album and has seen the D in concert, I couldn't find anything in the movie to keep me watching past the first 20 minutes. 173/200 Max Braden Even on fast forward I couldn't find anything fun about this movie. By now, probably the entire world knows the name Jack Black. Though up until a few years ago he was primarily used as fat guy comic relief in films, he's emerged as a legitimate star in his own right. He toplined the under-rated and sweet Shallow Hal, worked marvelously with a young cast in School of Rock, and starred in the disappointing but still massive King Kong. 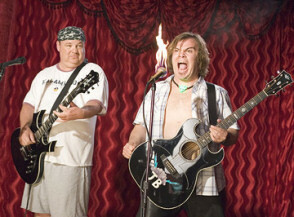 What many people don't realize is that Black has gained a bit of a cult following thanks to his founding and performing in a comedy/rock band known as Tenacious D. Tenacious D in: The Pick of Destiny will be a fictional detailing of that band's evolution.